As soon as the team had finished setting up at brands hatch the pit crew was busy. Our newest rider Llewellyn ‘Derek’ Thomas had a poorly R1 that would not go into 3rdgear and was leaking oil. After working into the early hours, the bike’s clutch had been rebuilt, the oil leak was found and repaired and we were confident the bike was good to go. The morning saw the pit crew with Adam the newest crew chief pitch up and straight away got on with adjusting ‘Derek’s R1. Adjustments over he was happy that the bike was finally behaving itself and his confidence grew for his first race. With the late arrival of Max and his ‘race ready’ R6 which had decided to recycle its own water pump we had a desperate appeal for a spare which was kindly lent to him. With the water pump fitted, Max was finally ready to race…apart from losing his exhaust around the track which was kindly returned to us by the marshals. The race before the First military round of the season and Stuart Goodson’s bike decided it wasn’t going to work anymore. The pit crew thought ahead and ran from the track side back to team awnings to remove the wet wheels from his wet bike and had to wait for him to turn up with the dry wheels. 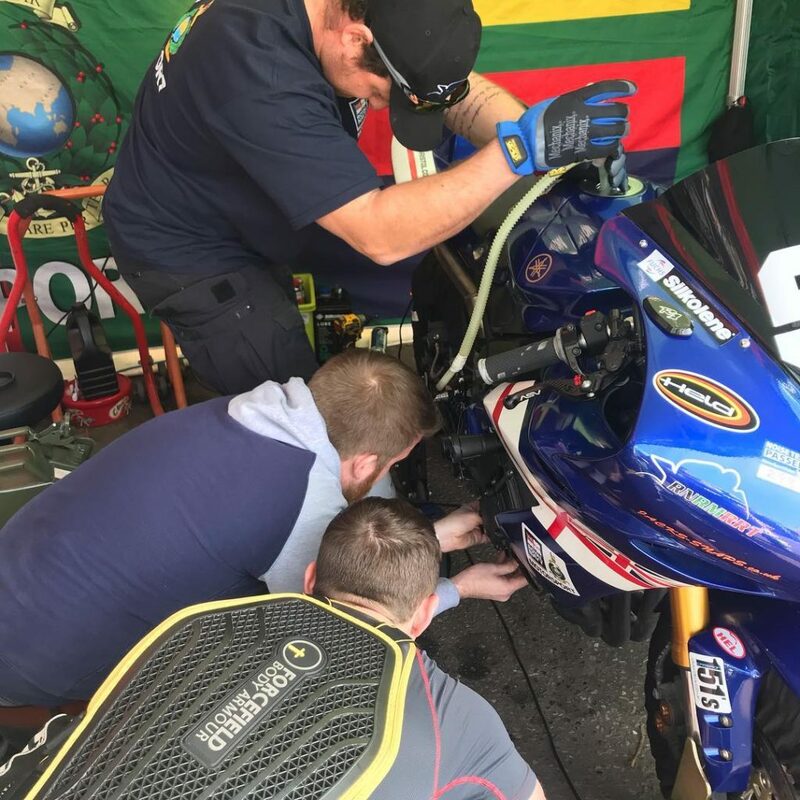 With only two pit crew trying to get both Stu and Luke Terry ready and the whole team out on time was seeming impossible but we managed to get both riders out to compete for some much needed points. During the intensity of the military race ‘Derek’ managed his first crash and Ross Obey pulled off a great high side but both bikes were fixed quickly. Sunday started off well until Max was take out during the sighting lap of his first race of the day. Fortunately he got away with a couple of scuffs. All in all a good busy first weekend for the pit crew team and some good results from the team. This was the first race weekend for me – what an incredible experience. From turning up with a van full of parts expecting to be spannering all weekend, to coming out with a trophy and a massive smile the other side was quite a rollercoaster. Without Alan Curtis staying up all night with me fixing the venerable R1 I wouldn’t have got out on track; hopefully the hysterical laughter and sound of the impact driver didn’t wake too many up in the small hours! 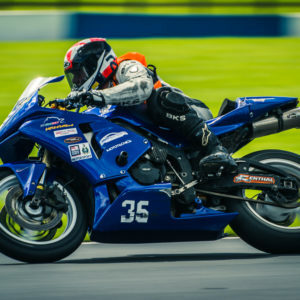 Adam Myhill’s vast knowledge firmly ironed out any niggles with the bike, and set me up to have a whale of a time not coming last – which was a huge surprise for me in the litre class. Chasing down the Army in the military race was the high point, until a lowside trying to put down the power on the cold side of the tyre coming out of the only sharp left on track. That was a lot less painful than my new nickname however, gifted for not being an ‘ambi-turner’…Derek. Started the race weekend off with qualifying on Saturday morning. I pushed myself to the front to try get some clear track and try follow some of the top 500 racers, which got me starting 19th. 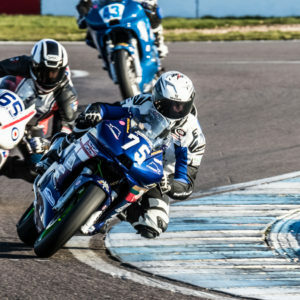 Race 1 and the chopping and changing into the first few corners was back on. After a few laps I was in 17th in a competitive group. As the last lap came I thought I had the pace to take the 2 racers in front. As I went to undertake them into Druids, one of the riders out-braked himself skittling the rider in front leaving me to take 15th. Race 2 – started much better as I broke away from the group I was in before, and tried to latch onto the faster group but couldn’t quite finishing 16th. Race 3 – had a great start pushing up a few places. Had the pit crew and Bri the team captain giving me a helping hand with our new pit boards. Just as I started to get into the race my throttle cable broke which left me out of the race. Race 4 – I was determined to do well. Had a great start again pushing up 5 places before turn 2. Latched onto the group I had been chasing all weekend. Lap after lap I was overtaking the riders in this group and eventually lead the group with a lap to go. Didn’t get the best run onto the home straight and had a photo finish for 3rd in class and 12th overall. Saturday morning started out as a beautiful day with qualifying taking place in glorious sunshine, albeit a bit chilly. 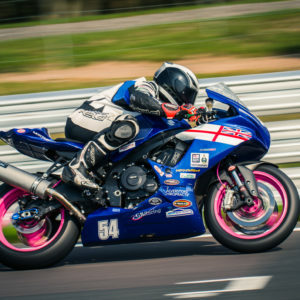 The session went well despite a few handling problems that secured me a 14thplace on the grid for my Golden Era Superbike race, and 7thfor the Inter-services Military race. Race one went well initially making a good start but unfortunately, I couldn’t hold off some of the more modern and more powerful machinery that was also sharing the grid. I had a few good battles on track but ended up a lowly 19thoverall at the end but 5thin my class. Second race of the day started off much the same as the first race but a few laps in my bike started to lose power and wouldn’t rev past 10K RPM, as I made it further around that lap the bike lost more and more power until it eventually died completely, leaving me no choice but to pull off the track and become a spectator for the rest of the race. Naturally I was devastated as I knew that the next but one race (about 20 minutes later) was the Military race, which is essentially what we are all here for. Fortunately, I have a spare bike sat in the paddock, but it was fitted with wet weather tyres which wouldn’t be very suitable in these conditions. What I didn’t know while I was sat trackside was that two members of our pit crew (LA(AH) Alan Curtis & CPOAET Adam Myhill) had seen me pull off the track and immediately ran back to the team awning to remove my wet wheels from my spare bike ready for my dry wheels when my broken bike is returned. Speed was of the essence here and I honestly thought I would never make the race in time and resigned myself to the fact that I was going to spectate this race as well, but the lads kept trying and working as fast as they could. Next came the dreaded announcement for all the GB Military riders to make their way to the grid while at this stage, only the back wheel was in place. I’m never going to make it now, I thought, but still the lads persevered while I was stood sweating in my leathers. Finally, it was ready! I jumped on and sped up to the collecting area but the warm up lap was already underway. I thought that was it, I’d missed it, but the staff surprisingly allowed me to form up at the back of the grid in 30thplace, which was very disappointing after qualifying 7th, but at least I’m in the race. My mission now was to try and get near the front as quickly as possible, but I also had to remember I had cold tyres, so I couldn’t start pushing until at least lap 2. After the first lap I started to push and commenced my challenge. I gradually started to pick of riders one by one and even lapped two riders eventually finishing 15th. Despite the misfortune of starting at the back, I had the most fun ever during that race. It was certainly one to remember and I couldn’t have done it without the help of the pit crew. BZ to them! Sunday; Race one saw me starting further back than the previous day due to my finishing position, so I was now two rows further back in 19thplace. I made a good start making up a few places and finished 16thoverall and 4thin class. Race 2 was the last race of the day and had started to get very cold and windy which had a slight impact on lap times. There were a few crashes in this race but fortunately I wasn’t one of them. I again started off in 19thplace but finished 12thoverall and 4thin class. All in all, a good weekend’s racing with a few ups and downs but fortunately no crashes. Now to get that broken bike fixed ready for Snetterton! The weekend got off to a poor start – I missed testing on the Friday due to problems getting the bike ready, however made it to qualifying only to get black flagged after one lap due to an oil leak, a shame as this was the first time I’d ridden in 8 months. Pit Crew worked tirelessly to fix the leak, however missed race 1, but being fully relaxed and confident for race 2. I started at the back of the grid and gained 3 positions, managing to defend this for the duration. During the military race I had an excellent battle the whole way with James “Jimmy” Cotrell and Ross obey. Unfortunately Ross crashed out in front of us, Leaving Jimmy and Myself to continue the battle. I just got the edge on the last straight, after major braking issues. Sunday was very similar to the first day, defending my grid position and working on later braking markers and corner speed. By race 2, unfortunately fatigue had eventually set in, so lap times took a considerable hit. All in all, a very busy and stressful weekend with many lessons learned, ready for vast improvement in the next round. I can’t thank enough the whole team, especially the Pit crew for helping me when needed. The team captain, Brian “The Luge” Fuidge, definitely helped with motivation and support throughout. It’s the whole team working together that really makes this sport so enjoyable, thanks to all.